Please note: Eye Can Fly software is downloadable software delivered via email and is not a subscription. Master control of your aircraft to become a fully-fledged pilot whilst learning Geography skills such as compass directions, landmarks and regions across the world as well enhancing your eye gaze skills. 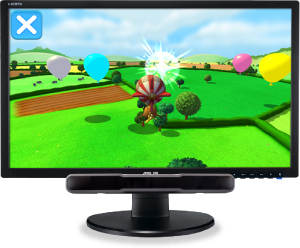 In addition to eye gaze, play can also be controlled with any mouse pointer device, the keyboard, switches and joysticks. Then let Aimee guide you through twenty four exciting missions to become a fully-fledged pilot whilst learning Geography skills such as compass directions, landmarks and regions across the world. Designed for students with some experience of eye gaze control and ability to follow simple verbal instructions, this package is easy to set up and takes the students through carefully graded activities to learn how to use eye gaze with precision and control. Useful options and a range of activities at different levels ensure success and maintain motivation for students of different ages and abilities. Compared to other “special needs” software Eye Can Fly stands out in appearance, characterization, soundtrack and challenge, making it appealing to a variety of ages and abilities. This is a game package that the whole family would want to experience, not just the disabled player. Eye Can Fly is a much needed addition to the EyeGaze repertoire. The graphics and interface are clear and well designed. The activities are purposeful and fun. My students have adapted to them very quickly and there are many options for them to explore in the future. I have particularly enjoyed seeing my least independent students experiencing what it’s like (well nearly) to be as free as a bird!